We are the loved ones of those who were murdered by juveniles. We formed NOVJM only for the purpose of supporting and informing each other. Our organization takes no specific stand on what criminal sentences for these offenders should be. Cases and victims’ views vary widely, and offender sentences are decided by the criminal justice system established in law by our society, not by victims’ families. We do stand for truth-telling in these cases. 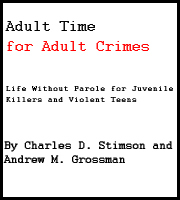 In the frenzy of well-funded advocacy for juvenile offenders in the last decade, the truth about these murderers has too often been minimized, or outright lied about. We stand for victims rights, and specifically those of all victim family members to be heard and participate fully as they choose in their cases. We stand for the importance of giving devastated victims’ families LEGAL FINALITY in their cases so that they do not have to spend much of the rest of their lives constantly having to re-engage with the person who destroyed their lives by murdering their loved ones. We urge courts, parole boards, and legislators everywhere to balance the justice process with profound regard for the literal torture that victims’ loved ones endure every single time anything to do with the murder case is re-opened in their lives. Resources also need to be devoted to support and inform victims families during these trying legal proceedings. We began as NOVJL, National Organization of Victims of Juvenile Lifers, but changed our name to NOVJM in 2014 due to our growing membership of many victims families of those killed by teens who received sentences far less than life – the majority of teen killers’ sentences. Loved ones of those killed by teens should join our NOVJM Facebook Group for the most up to date news and information, and to chat with each other. Read more About Us and What We Believe. NOVJM’s membership is sadly growing significantly as more victims families are being notified that recent Supreme Court rulings on juvenile murderer sentencing are leading to re-opening of legal proceedings in their cases. We welcome our new extended family but are sad for the reason. In March 2019 the Supreme Court announced it would hear yet ANOTHER teen killer sentencing case that will, no doubt, cause significant re-traumatization in the lives of many victims families across the nation. The newest case of Lee Boyd Malvo, the DC Sniper and mass murderer, will test the issue of life sentences that were discretionary rather than mandatory. We know that this case could change the current reality in which some life sentences and long term sentences are still constitutional for extremely serious murderers under the age of 18 at the time of their offenses, as Miller v Alabama clearly stated. Advocates for juvenile justice reform have not been willing to recognize that sometimes even young murderers sometimes represent a long term danger to public safety. Most of our members are working hard to be heard in court rooms and state legislatures across the nation, as courts consider what to do with their cases under Supreme Court rulings, and where lawmakers work to write new sentencing guidelines for juveniles that incorporate the new requirements that courts can take into account the age of the offender in choosing a sentence. 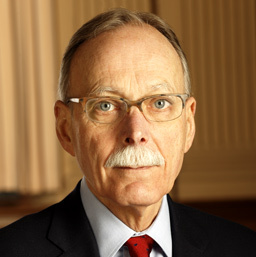 Weaver v. Massachusetts , June 2017, recently affirmed the conviction of a juvenile murderer even though his legal team, part of the well-funded legal services being offered to every juvenile killer in the nation that is serving a life or long term sentence, fought hard to argue that he should get a new trial. Victims’ interests were well represented by Randall Ravitz of the Massachusetts Attorney General’s office, and we are grateful that the state worked hard to protect the victims families in that case. In 2003, Kentel Weaver, then 16, shot and killed 15-year-old Germaine Rucker in Dorchester, MA, a crime for which he was convicted of first-degree murder. Mr. Weaver’s high powered pro bono legal team tried to use a technicality to argue for a new trial, even though they admit the killer’s guilt. They lost. 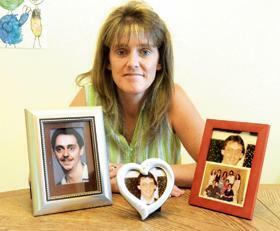 Victims families deserve legal finality wherever possible. So we are gratified for this ruling. The Supreme Court of the United States in 2016 ruled against the best interests of victims families who very much want and deserve legal finality at some point in the murder cases of their loved ones. In a case that has decided the retroactivity question – Montgomery v Louisiana, the opinion, like all Supreme Court rulings, leaves much to interpretation, but appears to possibly potentially re-open every long term or life sentence given to any teen killer in this nation, going decades back in some cases. The majority opinion from Justice Kennedy can be read here. Victims families are urged to get in touch with the prosecutors in the county where their murder cases and trials took place for more information. We also ask all victims families to stay in touch with NOVJM about developments that they hear about in their own cases and states – email us at NOVJM@aol.com or through our Facebook and Twitter @VctmsTeenKillrs. Please join in our mutual information sharing and support. Since the U.S. Supreme Court decided that Miller v Alabama is retroactive, we have been advocating, as best as our limited resources would allow, to all that will listen, that this ruling will likely affect negatively tens of thousands of murder victims family members all over the nation. And worse, most of whom had no idea there was any challenge to the prison sentences being served by their loved ones’ killers, and as we are already hearing, are shocked to find out that this change in the sentence of their loved ones’ murderer was even a possibility. Worse, many will not be able to even be notified of this devastating development because they walked away from the life sentences given their loved ones’ murderers believing they were permanent, and have not stayed in contact with local officials for notification of this legal nightmare just re-opened by the Supreme Court. We are now living the ramifications of this horrible ruling for victims families, some of whom have already shared personal shock and re-traumatization on our NOVJM Facebook group where we discuss and share with each other. We want to stress to all victims families reading this that so much is happening so quickly in so many places around the nation, this website is not going to be able to provide updated information regularly. Unlike those who killed our loved ones, we have no budget, no staff, no funding for advocacy. Our Facebook group is THE BEST WAY to find out what is happening and to talk to us. Please join us there! We submitted an amicus brief that states our view of the Montgomery case and were present at the Supreme Court in Washington D.C. on OCTOBER 13, 2015. Please visit the memorial page for Officer Charles Hurt, the murder victim at the center of the Montgomery case. As there will be much news media attention on this case, our NOVJM members that are willing to talk to the press can be found here. Our media release for October 13, 2015 at the Supreme Court can be downloaded here. Thank You to Jack Park, prominent attorney at the Strickland Brockington Lewis Law Firm in Atlanta, Georgia for representing NOVJM pro bono before the U.S. Supreme Court, and authoring our amicus brief. You are a hero to victims families. Current NOVJM leaders include Jennifer Bishop-Jenkins of Illinois; Bobbi Jamriska, of Pennsylvania; Jody Robinson of Michigan, and Dan Frye of Tennessee. NOVJM Leaders can be reached at novjm@aol.com. Those interested in serving in leadership of NOVJM are most welcome and encouraged to send us an email expressing your interest. Photo: NOVJM murder victim family members of those killed by teens from all over the nation at the United States Supreme Court during the argument of Miller v Alabama in 2012, a case that could free their loved ones’ murderers. NOVJM, formerly NOVJL, exists to support and inform victims families and friends of those killed by offenders under age 18. We found it necessary to organize ourselves, given the significant and well-funded advocacy effort that exists for those offenders that gives no information or support to the victims families of these crimes. NOVJM is devoted to victims rights and sound public policy regarding teens who kill. 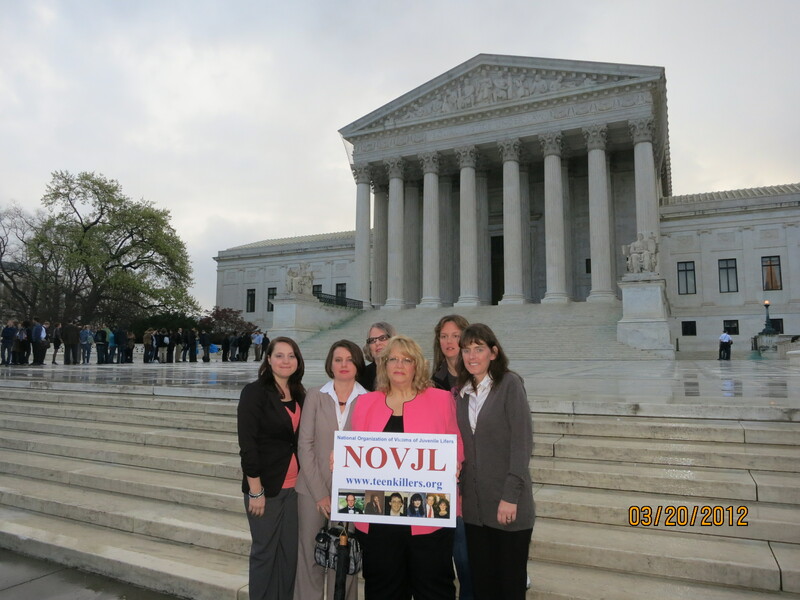 We began as NOVJL (National Organization of Victims of Juvenile Lifers), founded in 2006. We were a small group of victims families very concerned about the complete lack of information available to other victims’ families about the staggering multi-million dollar campaign to free our loved ones killers. In 2014 we changed our name to NOVJM reflecting our significantly growing membership that included many victims’ families whose loved ones were murdered by teens but whose offenders were not sentenced to life in prison. NOVJM today reflects hundreds of voices of victims families from all over the nation. We are an all-volunteer organization that works to provide information and emotional support to our fellow loved ones of those killed by juveniles. We hope to bring victims voices to the public policy debate about these offenders, while stunning sums of money are being spent by juvenile advocates to reduce or even end the prison sentences being served by the killers. At first we believed that those juvenile advocates would care about victim outreach and support, but after years of effort at bridge building on our part, they have refused to share even basic information with us about their campaigns, instead lavishing all their resources on convicted murderers. This website tells the true stories of those murdered by teens – truth that is especially important in the face of the willingness of juvenile advocates to minimize and even misrepresent the facts of these horrible crimes in their attempts to paint a picture of reduced culpability by the killers. We know there is much to discuss in public policy regarding teens who kill, but good decisions can only be made when the full facts are known. We know that in every crime some offenders are more or less culpable depending on the individual facts and circumstances. But LIGHT is a great “disinfectant”. Blurring the facts of these crimes does not improve the public policy discussion. We advocate for the constitutional and statutory rights of crime victims that exist in all 50 states and federally. We advocate for best possible policies to prevent such tragedies from ever happening again. We understand the controversy around the issue of teens who kill and the destruction left in the aftermath of those crimes – we are LIVING it. We understand the powerful feelings that the youthful age of these offenders creates. We understand the problems in our criminal justice system, as with any human institution. We often do not understand, however, the incredible focus on helping these offenders with no compassion for or attention to the victims they created. The behavior of juvenile justice reform advocates towards the victims families of these crimes during their national policy change push of the last few years has been poor, to say the least. These offenders have committed some of the most horrific murders imaginable. We miss our loved ones horribly. 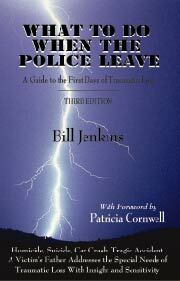 There are thousands of murder victims’ family members in this nation who are not aware that there is a movement that supports and advocates for teen killers that seeks to change the terms of their incarceration, and often without any notice to victims families, and that there have been Supreme Court rulings in recent years that will dramatically affect their lives and cases. If you are aware of any victims families of juvenile killers please invite them to contact us. This page is webmastered by victim volunteers. We do our best to gather accurate information. Please email us at NOVJM@aol.com with any edits, corrections, or suggestions. Thank you.